I received an e-mail to my blog address from Brian at Underground Cellar asking if I'd be willing to share the latest news about his venture with my readers. First of all I had to take a look at their web site to learn what they were about since I was not familiar with them. After doing some reading, as well as signing up on their site, I think it is a worthwhile site to write about. Note that the e-mail said they had "something special" for me if I chose to include them in this blog but that has nothing to do with their inclusion; for all I know they could be sending me a dead fish through the mail. Underground Cellar ("UC") has an interesting concept. Each day they offer a small selection of wines (four for today as I write this) for purchase. 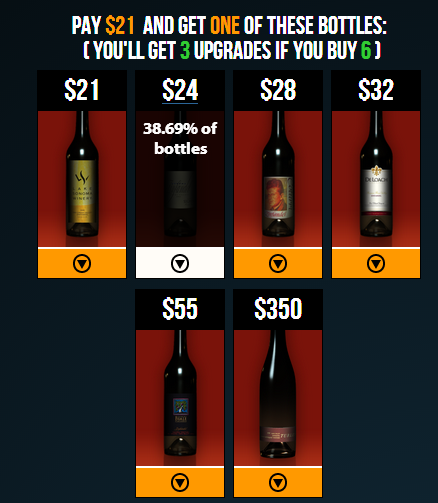 The interesting part is you select the bottle you want to buy but are then automatically given a chance for a random upgrade to a more expensive, and theoretically a better wine for that same price. This particular wine is $21, shown above. Once you order and pay for it, however, you just might be the recipient of a random upgrade to one of the higher-priced bottles. Unlike those discount hotel sites that don't tell you what hotel you are bidding on until you buy, UC lets you know what the other possibilities are, and also tells you your odds of receiving an upgrade. 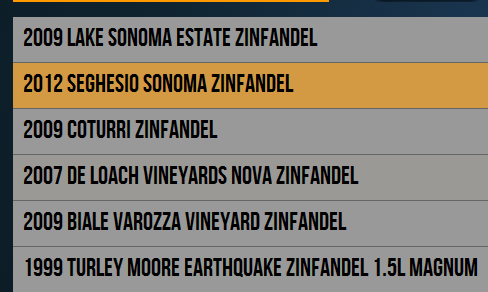 Above, it shows you that if you order the $21 bottle, you have a 38.69% of getting the more expensive Seghesio Zinfandel instead. The different upgrades are listed - see the screen shot below. Yes, interesting concept, I'd say. Is this a legit site? It seems to be. They have reached the $1 million mark in seed money, including an investment by Shark Tank celebrity investor Barbara Corcoran. The way the site operates will appeal to the gambling nature within us by taking a spin for an upgrade. 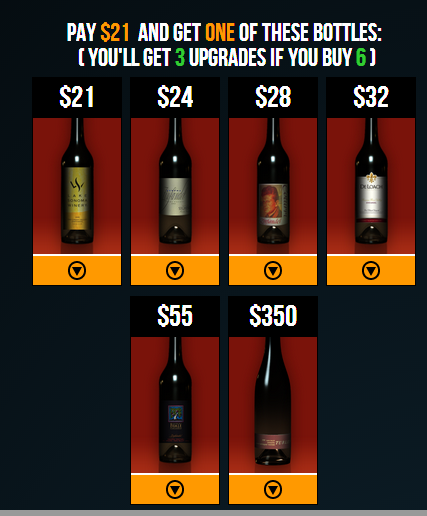 I like that idea (although what happens if you really really want the original wine and not the upgrade?). The option is available to defer delivery by having your wine placed in "Cloud Storage" - a temperature-controlled facility in Napa Valley, until you decide to have it shipped. You can order as little as a single bottle. Shipping on six bottles is a flat $5 per shipment and a case earns you free shipping. Therefore you could make several single bottle purchases and have them held in Cloud Storage until such time as you have a case, and then get free shipping. The Cloud Storage is also very helpful for avoiding shipping in hot weather. Are the wines any good? You can see for yourself from the above that these are credible wineries with good reputations. I looked at previous offerings and these not mystery wineries. My only comment is that some of the vintages are not current releases and some are releases from several years ago (such as the 2007 De Loach Zinfandel listed above) but assuming they have been properly stored, the buyer is getting the benefit of aging without having to pay extra for it. UC guarantees customer satisfaction, and they say the wines come straight from the winery so it sounds like a safe deal. My Google search didn't reveal anything negative about them. Probably the best thing to do is visit their site and check it out yourself. It's easy to understand what they are doing and it costs nothing to register, then see what is offered each day. I signed up. I haven't bought anything yet since nothing interested me but I'm curious to see what comes up as time goes by. There is also a member forum but I have to say right now it seems pretty lame as not very many people participate and those who do seem to be the same ones in most of the threads. Someone from UC actively participates, though, which speaks well of their desire to be helpful. My two cents - the layout also looks too AOL-ish for me. As for the actual operating site - I think it's worth visiting and registering. It's like Forrest Gump's box of chocolates - you never know what you're gonna get. The other day a planned power outage notification came in the mail from Southern California Edison. Naturally the first thing I thought about was how this would affect the wines I keep in my three little wine coolers, especially given the hot summer we've had here in Southern California. The outage was scheduled for tomorrow - September 17th, from 10:00 am to 3:30 pm. Today when I got home from work, I discovered that SCE pulled a fast one and had the power outage today! I thought that was pretty crummy of them to do this and not let anyone know so that they might prepare for it. Now, I am only guessing/hoping that today's outage was what originally was planned for tomorrow. When I called SCE the customer service assistant was clueless. She said it made sense that today was it, but tomorrow's outage was still showing on her schedule and had not been canceled. She told me to call back tomorrow. Well duh, I might as well just wait and see if it happens or not if I have to wait until the day it is supposed to happen. That really ticks me off. I hope that today was the planned outage because two days in a row with temperatures near 110 is ridiculous to have an outage on purpose. The house was 93 degrees when I got home. Guess what? I just checked SCE online and now it says that the power outage will be rescheduled: "Certain conditions have caused this outage to be rescheduled." Hmm.. maybe the "certain conditions" are that IT WAS DONE TODAY AND CAUGHT EVERYONE BY SURPRISE!!! I imagine people must have protested an obviously bad idea of depriving residents of electricity on one of, if not the hottest days of the year so they sneakily did it today to catch everyone off guard. Anyway, that's not why I am writing this post. I wanted to let you know how my wine coolers fared on this 110 degree day with no electricity for 7 hours, from 9:30 am to 4:30 pm. First off, the fridge seemed pretty well insulated. The freezer, normally at a -2.2 degrees, went up to 12 degrees so the frozen stuff survived. So did the items in the fridge compartment; the temperature there was about 42 when I got home, which is just a few seconds before power was restored. Normally it is around 33-35 degrees. The thermometers showed the room got as hot as 96 according to one, and 93 according to two other ones. I tend to think the two at 93 are more accurate. Now that's hot! The latest wine cooler, a 24 bottle dual zone Wine Enthusiast brand that has 12 spaces each in the upper and lower compartments, registered a high of 76.6 degrees in the upper space and 70.5 in the lower. The upper space was measured with the thermometer that had the higher room temperature reading than the other two, though, so I am thinking maybe the max was a degree or two lower than the 76.6 reading. It's a thermoelectric cooler. Normally the top is around 56 degrees and the bottom 55 degrees. The 16 bottle cooler, also from the Wine Enthusiast is a 4x4 slot single zone thermoelectric cooler. This one hit a high of 65.7 degrees. Normally it is in the 54.1-54.5 range. My Vissani cooler, the oldest one that has a compressor, normally shows a mid-56 temperature. It went up to 64.4 degrees. I'm relieved. While this increase in temperature did no favor to the wines, at least it didn't get warm enough to damage them. Assuming 76.6 was the warmest any compartment got, that isn't bad at all considering 7 hours without power in 100+ degree outside heat and 90+ degree indoor heat. Looks like the Vissani has the best insulation, warming up by only 8 or so degrees, whereas the Wine Enthusiast units ranged from 10 to 20 degrees. As far as cooling back down, the power came on at a little past 4:30. It's nearly 9:30 and they haven't yet gotten back to where they normally are - not even the Vissani. They're close but not on the mark. The Vissani is full whereas the others aren't at capacity. Yet. The house isn't back yet, either. The thermostat is normally at 80 degrees and it's 82 in the house with the air conditioning running. I just don't want to put these appliances through that test again. The other day I wrote about wine ratings and the point scale. So a wine that is merely "OK, but nothing special" merits 90 points? I was wondering if perhaps that is because it is the Esprit de Beaucastel that is being rated and thus any vintage automatically warrants at least a 90 due to its stellar reputation? Would an "exceptional" bottle of Two Buck Chuck warrant 85 points, simply because it is Two Buck Chuck and thus could never warrant a score of 90 or above? Just some food or wine for thought. Last night my brother in law brought a bottle of 2012 Melville Syrah, Verna's Vineyard to a family dinner. Despite the less-than-ideal glasses, I thought it was a very good wine. Giving it a slight swirl (as much as could be expected given the tiny glasses) and sniff, my nose was hit with the aromas of bacon fat. Lots of it. I asked my wife what she thought it smelled like. "No, it smells like grapes." Then I asked my sister in law on the other side of me what she thought it smelled like. "Bacon? There's bacon in this wine???" My brother in law interceded. "Beef blood." Then he started looking up Parker's rating and review on his iPhone while my sister in law was looking at the wine in her glass. I could taste the beef blood in the wine but for me bacon aroma was the most outstanding characteristic. I said this would go great with a steak. I told her the reason it smells like bacon and beef blood is because instead of people stomping on the grapes to crush them, this winery used pigs and cows. Anyway, the only people in my wife's family who drink wine other than when my brother in law brings some to dinner are my brother in law, his wife (not the same sister in law as the one sitting next to me), and me. Generally at least 1/2 the bottles he brings go unappreciated as some of the family mixes the wine with soda, or puts ice cubes in it or even mixes it with tea. As for the "smells like grapes" comments from my wife and her sister, it made me wonder if maybe us winos just make ourselves smell things, anything besides grapes, when we sniff a wine. 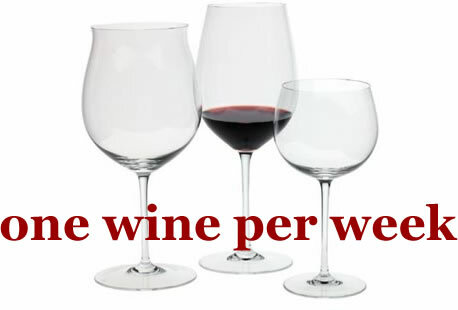 Or is it that folks who don't normally drink wine just smell grapes because they know that's what it is made from. Or maybe they just don't care. Who knows. But I did think it was a nice bottle of wine. Good complexity, balanced with a firm backing of acidity, a long finish and nice weight/texture. I'm glad my brother in law brought it. In part two, I mentioned I had made a list of wineries to check out from ones mentioned in Jon Bonne's book, The New California Wine. Some of the producers made wine available to purchase only to those on their mailing list, and many of those had wines available by allocation only, at certain times of the year. I put my name in on several of these mailing lists; for some, I had no real clue how much the wines cost but I figured when the time came, I'd find out. Just recently, I did find out and talk about sticker shock - I wasn't prepared for some of the prices I saw when notified of my allocations. For example $160 bottles from Kongsgaard. Mind you, I am not complaining or being critical since prices are all relative and who's to say what any bottle is "worth." I wasn't expecting such a high tariff is all. Yesterday Favia released their wines. Bottles for $145, a bit less than Kongsgaard. I scratched those two off my list. I had raised my wine budget but that was far above the ceiling I set. One winery released their fall lineup and I logged in to see my allocations. I was met with a statement that I had no allocations at that time. Oh, well. Again, not complaining because I understand the spoils go to the loyal, repeat customers and that's how it should be. Maybe next time they'll have something available. There were also a few wineries to whom I wrote with questions and never received a reply. I won't mention who they are, but I scratched those off the list as well. They were just simple questions, nothing touchy or requiring a detailed answer so as to why they never bothered to respond is beyond me. Now that, I'm complaining about. How hard is it to reply? The vast majority of wineries sent back a response. I think I ended up with a pretty good list. Darn good, I'd say. Next time I'll start mentioning the wineries and what made me either join their wine club or, if they don't have a club, to place an order. Most of them I've never even sampled any of their wines but they just sounded good. I can't wait to give them a try.